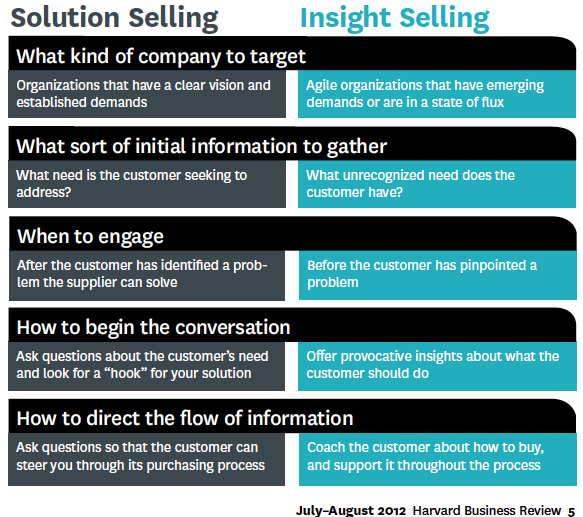 Less than a year ago, the Harvard Business Review published this article: the End of Solution Sales. It caused a bit of a stir. After all, the way customers need to be approached and engaged is changing, and Solution Sales no longer fits the bill. Still, nobody likes to be told that the model they are currently working within is now irrelevant. 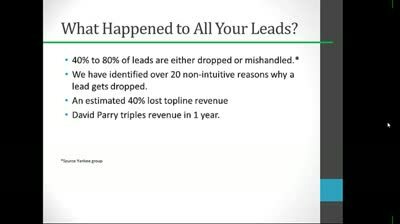 More to the point, Insight* Sales (which the authors claim is rapidly replacing Solution Sales) is far tougher than what you are probably doing now. Insight Sales relies heavily on the intelligence, intuitiveness, and personal chutzpah of the individual sales rep. Instead of providing pat solutions for customers’ existing needs, Insight salespeople tell them what needs they are going to have in the future. This calls for some advanced thinking on the part of the salesperson, who must essentially serve as a consultant or coach. Let’s apply Solution Sales vs. Insight Sales to one of our customers, a Managed IT Services Company. We’ll call them Bob’s IT Solutions. 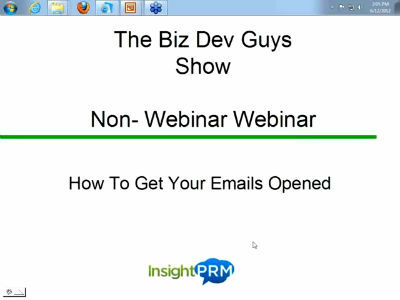 In the past, Bob started off sales calls by asking prospects if they were looking for Managed IT Services or if they were happy with their current provider. 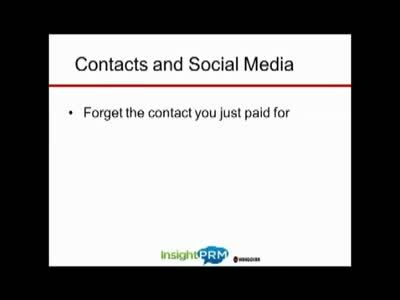 If prospects said they were looking, or if they expressed discontent with their current service, Bob gave them his pitch about how Bob’s IT Solutions does things differently, provides great customer support, blah, blah, blah. That’s Solutions Selling. Bob’s prospect had a problem—they weren’t happy with their current service—and Bob sold them a solution. Eventually, Bob realized that customers don’t just wait for him to call. If they need Managed IT Services, or if they are unhappy with their current service provider, they go to the internet and find a solution themselves. So he tried something bold. When he learned that a nearby company was planning on moving to a new office building, he called them and related a startling fact: 75% of data backups do not properly restore after hard drive failure, which is a common occurrence following an office move. He went on to explain that many Managed IT Services providers do not have experience in the particular needs (and risks) of a relocating company. This was Insight Selling: anticipating a customer’s problem before it occurred. Ultimately, being Insightful was more effective, because Bob was able to guide his client through the process of relocating their IT equipment and save them a lot of potentially disastrous problems. Of course, Insight Selling doesn’t come with a formula, and that’s why it depends more than ever on talented B2B salespeople who actually take the time to think about how their customers are doing business. The most successful Insight salespeople have a vision for each prospect. They challenge prospects’ expectations and even make them rethink how to run their companies. So how can you help your sales team make the shift? For one, encourage them to look at each sale as the beginning of something, not as the end. The goal is to be part of the evolution of your customer’s company, and there’s no one-size-fits-all script that will help you accomplish this. Instead, each salesperson needs to become a coach, an innovator, and even a provocateur. 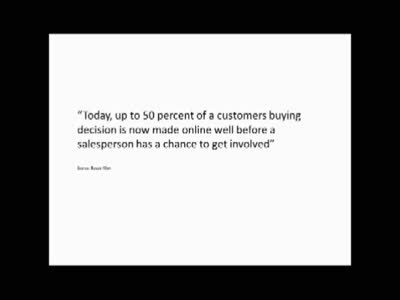 To sum it up, salespeople will need to be not just knowledgeable, but also passionate about the product they sell. They’re going to have to care more, and it’s going to make the job of sales a lot more demanding—in a good way. *It’s completely coincidental, though remarkably fitting, that this sales model shares part of our name. Graphic borrowed from the Harvard Business Review.